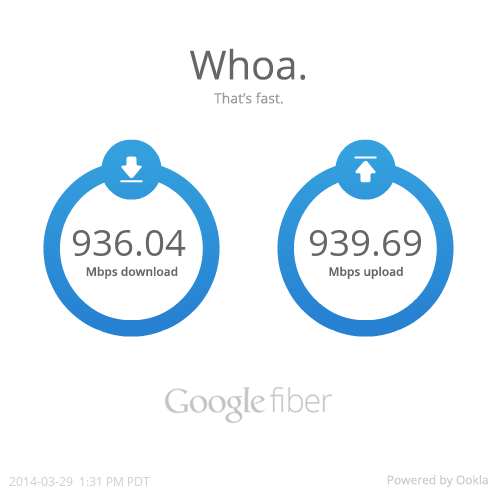 As a fairly recent Google fiber subscriber I’ve been very pleased with the service. I wanted to learn a little more how it worked and what kind-of stats might be available from the in-home equipment. The physical setup is much like as you might expect if you’ve ever setup a DSL modem or cable modem + a residential router. Gigaom has a nice rundown @ Google Fiber: Check out the in-home set up and equipment. Namely I wanted to focus on any stats available from where the physical fiber turned into an Ethernet port. This is known as the Fiber Jack, I have the model GFLT100 which is also known as an Optical Network Terminal or ONT. A little searching reveals that it’s likely Google is using Gigabit-capable Passive Optical Networks (GPON). There’s a particularly interesting paper: FTTH Look Ahead - Technologies & Architectures. Off the GFLT100 information page there’s a link to the Google Fiber Open Source Components, specifically the Open source code for the Google Fiber GFLT100 (which is what Matthew Stone notes in his article points to all the GPON source additions).